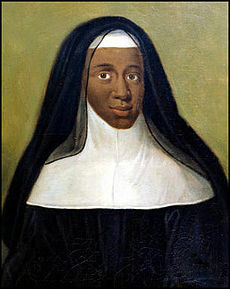 Louise Marie-Thérèse, also known as The Black Nun of Moret (16 November 1664 – 1732), was a French nun and the subject of accounts from the 18th century in which she was dubiously claimed to be the daughter of the Queen of France, Maria Theresa of Spain. Her existence is mentioned in several different sources. The Black Nun of Moret, Louise Marie-Thérèse (1664–1732), was a Benedictine nun in the abbey of Moret-sur-Loing. She was called the "Mauresse de Moret" ("Mooress of Moret"), and a portrait of her exists in the Bibliothèque Sainte Geneviève in Paris. Research done by the Société de l'histoire de Paris et d'Ile-de-France, published in 1924 by Honoré Champion éditions, concluded that this pastel portrait was painted around 1680 by the same hand which painted the series of 22 pastel portraits of Kings of France, from Louis IX to Louis XIV, between 1681 and 1683 on the initiative of Father Claude Du Molinet (1620–1687), librarian of Sainte Geneviève abbey. No fewer than six writers from the time have devoted paragraphs to her: she is mentioned in the memoirs of Madame de Maintenon, the Grande Mademoiselle, Madame de Montespan, Duke of Saint-Simon, Voltaire, and Cardinal Dubois. Shortly after the death of the French Queen Maria Theresa of Spain, wife of Louis XIV, in 1683, courtiers said that this woman could be the daughter, allegedly black, to whom the Queen gave birth in 1664. The nun herself seemed convinced of her royal birth, and Saint-Simon states that she once greeted the Dauphin as "my brother". A letter sent on 13 June 1685, by the Secretary of the King's Household to M. De Bezons, general agent of the clergy, and the pension of 300 pounds granted by King Louis XIV to the nun Louise Marie-Thérèse on 15 October 1695, "to be paid to her all her life in this convent or everywhere she could be, by the guards of the Royal treasure present and to come" suggest that she may, indeed, have had royal connections. She died at Moret-sur-Loing. This page was last edited on 23 March 2019, at 04:42 (UTC).